Yet I also recall Phil Hill showing a serious, caring side of himself when entering the Hotels bar where he and my roommate had been watching the CART practice session from Laguna Seca when gravely he announced that Rookie Gonzalo Rodriguez had just died in the Corkscrew; as I wonder how many Drivers’ deaths had Phil endured? 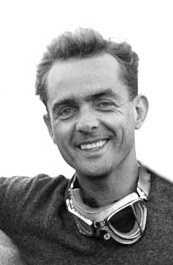 As many will know that it was Hill’s Scuderia Ferrari teammate, the late Count Von Trips who perished at Monza in order for Phil to capture his Grand Prix crown. Meanwhile unbeknownst to me was the fact that Mr. Hill was in pain the whole trip while awaiting hip replacement surgery! (All I have written down for today’s journal entry is that today we’re seeing RED!) As in FREAKIN’ FERRARI ROSSO! I remember riding our tour bus through the very “ritzy” upscale strip-mall shopping district of the tiny city of Maranello on our way towards the factory. YES! Today I’m going to be entering the hallowed halls of the Scuderia Ferrari Factory! Walking through the factory towards the body assembly area a gaggle of shop employees came running towards us. Gleefully talking excitedly in Italian, as they sought out Phil Hill for his autograph holding racing books open... They were all very young employees and unlike Lamborghini they all wore matching uniforms. Sporting bright Ferrari red pants and white T-Shirts emblazoned with the racing teams sponsors. I remember standing there totally enamoured as we watched a worker stuff flexible exhaust hose tubing onto a just completed silver 360 Modena’s exhaust. Then on the very first turn of the key, the engine fired as we listened to the sweet sound of the idling Ferrari burble away! Since at this time Ferrari had just three models in production; the entry level 360 V-8 Modena alongside two V-12 models: The 456GT/GTA and 550 Maranello. Ferrari had just completed building it’s special run of 349 F-50’s and the 360 Modena’s were on one assembly line, while the 456’s & 550’s occupied a second separate assembly line. Next we walked outside and I remember there being Ferrari’s littered (parked) everywhere, before we entered a small room where the Ferrari’s received there final inspections after being “road-tested. As they go for brief jaunts on the nearby public roads, although Ferrari owns its own test track. Then it was back to the lobby to re-join the other half of our tour group. Total start to finish production time per car = 1.5 days, (each) i.e. ; Engine casting, Body build, Drive Train, Wiring, etc. Ferrari offers a choice of 17 colours, with Italian’s favourite choice being Rosso. (Red) (Of course) their other favourite colour = Yellow. At this time Ferrari had 2,000 employees including 500 devoted solely to the racing department. As the Cavallino Ristorante is a very famous place, where we had a very long table awaiting us; resplendent in checkerboard car motif table covering. As we sat drinking a little vino along with our first course a voice said: “Quick. Look out the window!” It was Luca di Montezemolo and Jean Todt strolling by as our head waiter immediately disappeared! As they were on their way to the private dining room. I recall having a wonderful three course lunch served in white stone china with a small black band along the top edges of the plate/bowl with the Prancing Horse logo in black, whilst sitting at the long table discussing our morning’s Ferrari experiences the sun shone through the large rectangular window that we’d previously seen Ferrari “royalty’ saunter past. After lunch we were given free time to explore the surrounding shops before leaving for the Ferrari Museo, as I recall standing in the warm sunlight watching a pack of laughing Ferrari employees rush past me… As the throng of red & white clothed employees quickly ran through the cobblestone courtyard, obviously on there way to lunch, before a small group of us decided to walk down to the Fiorano test track, since we could hear the siren song of a Ferrari F1 chassis being fired in the near distance! As we practically ran down the street the entire way as the noise grew louder! Standing along the edge of an embankment, we were treated to the brief glimpses of Mika Salo performing test work prior to the upcoming race. In our euphoria we’d totally forgotten we were standing alongside a two lane highway. To which we were quickly awoken from our discretion by a delivery truck blasting us with his horn, urging us to get off the road! The top floor was unbelievable! Filled with Formula One chassis, there were Gerhard Berger’s and Nigel Mansell’s cars to walk around, as these featured my favourite livery of AGIP. (Pre-Shell Oil sponsorship) While along the Museo’s far wall, was a fantastic full size mural painting of Michael Schumacher’s car racing through the rain… While In front of it was an early Schumacher chassis.